This is a simple quilt, with squares arranged so the design is diagonal across the body of the quilt. The fabric is a variety of large scale (some so large they are ginormous) floral prints I collected over two or three years. The scale is so large in some of the prints only one petal is contained in the square. I did that on purpose, I just wanted a riot of color. You probably also noticed a kind of rainbow effect in the order of the colors, it was fun to figure out how to arrange them. I more or less improvised the border fabrics, with the primary one a geranium print with wonderfully rich greens and reds. I started this quilt when my mom and I worked on sewing projects while we spent a week or so at the River House in Bandon by the Sea a few years back. That’s why it has a special place in my heart. 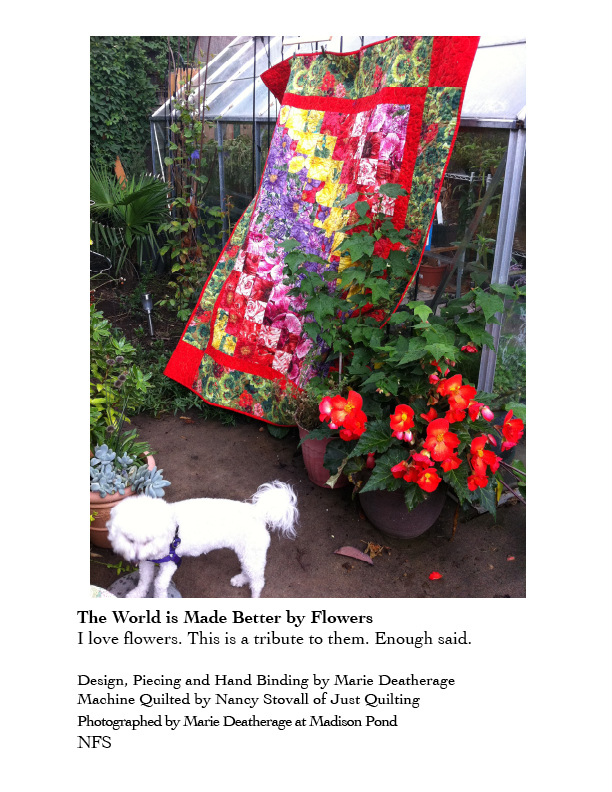 A floral quilt in a floral yard. With dog. Such a beautiful quilt…and your title for it fits PERFECTLY! !